Food blogs are an enchanting thing – interesting stories coupled with beautiful photos and handy recipes make for an overall popular niche. Have you considered writing a food blog? Maybe creating a space online for your pictures of exquisite dinners, memorable meals, and must-share recipes? If you have, you probably asked yourself how to start a food blog? If it seems daunting, read on! Carving out your own online space to blog and maybe even create your own career doesn’t need to be difficult, time-consuming, or expensive! Between the easy WordPress setup and affordable cost, creating a food blog with Bluehost can be a simple beginning to a rewarding creation! Learning how to start a food blog isn’t nearly as inaccessible as it might seem on the outset. 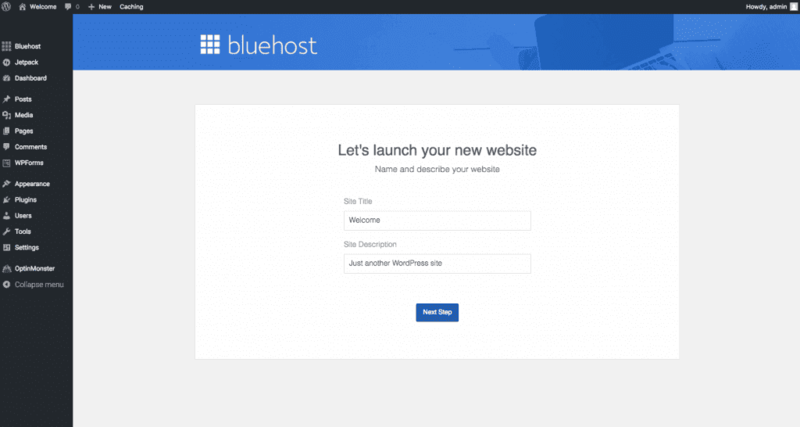 Bluehost is probably the best host for food blog creation because it’s incredibly simple to start and automatically installs WordPress upon setup. If you don’t already know, most of the web runs on WordPress; it’s simple, beautiful, and intuitive in the way that makes blogging accessible to anyone. Hosting a WordPress site on Bluehost also creates a simple money-making stream through affiliate programs, allowing creatives both an outlet for their passions and a way to supplement or even replace their primary job! Check out this coupon, only available to my subscribers, to get started with Bluehost at an incredible rate! Of course, the first step to starting a food blog is getting simple WordPress hosting set up. You’ve probably seen a lot about Bluehost simply because they’re one of the most trusted, most reliable site hosting services available. Well over 2 million WordPress sites are hosted on Bluehost servers, and they’re perfect for beginners and seasoned bloggers alike! A free email address tied to your site, making growing a professional email list a snap! Why not start a free blog with WordPress? If you want to actually make money and reach real followers, blogging with a free WordPress account won’t take you very far. Though a hobby blog is nice, you’ll still have advertising on your site, you just won’t make money from it. With paid food blog hosting, you can customize your ads, post your own affiliate links, and make your OWN money, without paying WordPress first. Companies are also wary of working with blogs hosted on free host services, as it gives off a less-than-professional tone. 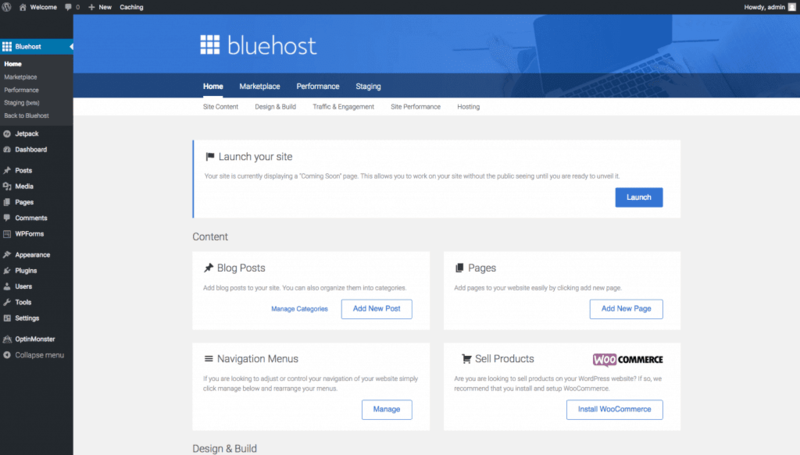 Starting with a paid hosting service means you can avoid the headache of porting a free blog to a paid service once you take off, and the best host for a food blog is definitely Bluehost. Sounds good, how do I begin? These are the plans offered; my discount rate is for the basic, which provides more than enough tools and bandwidth to start a food blog with easy WordPress hosting. Once you’re off the ground, you can take a look at the more extensive, professional plans. The domain name is one of the most fun parts of Bluehost setup! This is where you choose the name of your site that will project your brand out to the thousands of hungry followers with whom you’ll engage. Go for something that fits your food blog niche; something clever, cute, and especially a play on words is always great! You want to create something both memorable and easy to remember. For instance, Debbiesfoodblog.com is boring, but DebbiesDelectableDesserts.com POPS, it’s alliterative, and it tells you what to expect. As I stated before, selecting the 3-year plan is the best value, and if you use this code, you’ll get the best price. If you decide to cancel later, they’ll refund you for the unused months, so it’s really risk-free to go with the longer plan, as it’s the cheapest per-month rate. 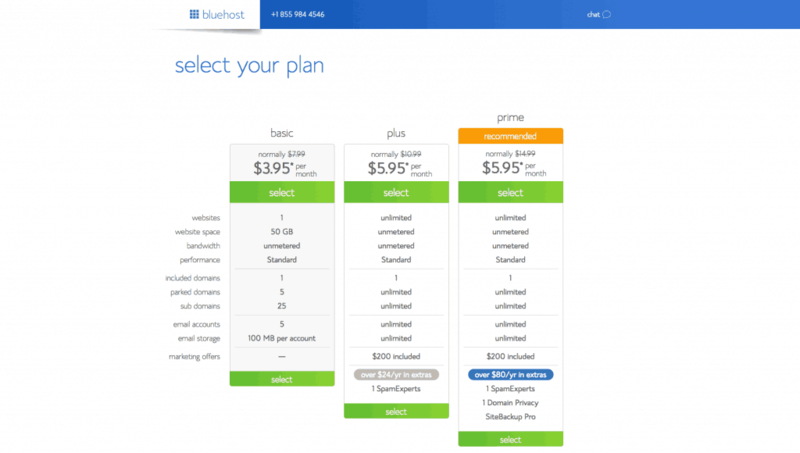 Any honest Bluehost review will tell you to go with the 24 or 36-month plans; they’re simply a much better deal! There’s also a lot of other options here, and you can investigate them later, but the ones I’d recommend starting out are SiteLock Security and Site Backup Pro. Though a thorough Bluehost review proves they have some fantastic safeguards, extra security and backup plans are always a good investment. 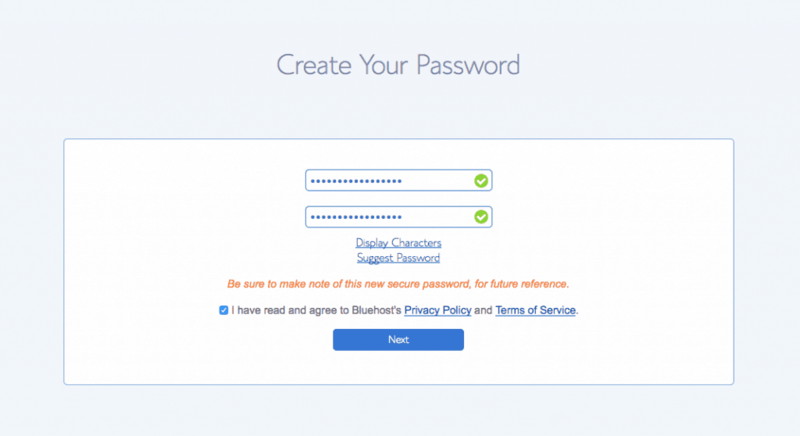 After password creation, we’re off to the races! You’ve not only found the best host for food blog creation, but you’ve also finished the hard part! Now comes the fun! Let’s create your food blog! Your blog is like a house. 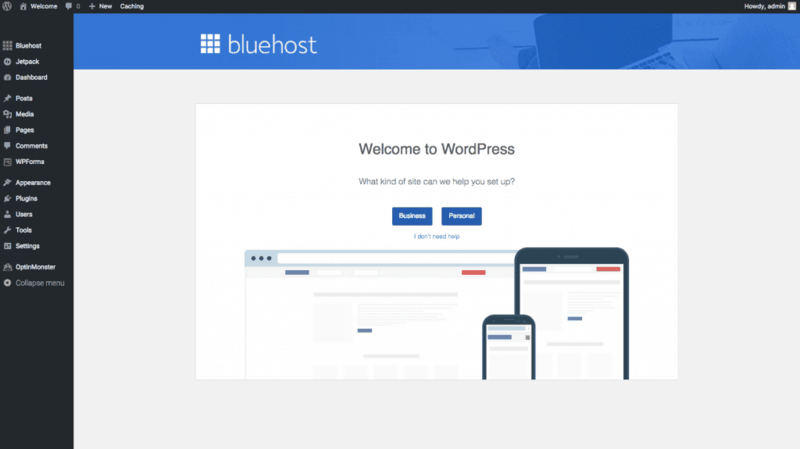 So that means that Bluehost is like the land you purchase upon which you want to build your house, and WordPress is the framework you USE to build your house. That was the analogy that made the most sense to me. Plugins are like tools that make house-building easier or help you monitor how your house is doing. Though you’ll want to play around with plugins, I HIGHLY recommend Yoast to start out. It will monitor your posts’ readability and SEO-optimization, and it’s incredibly useful for making sure your blog is searchable. Finally, a theme is how your house looks; Victorian or modern, ranch or classic? Oh, speaking of ranch, let’s get back to creating your food blog. Like I said before, one of the main reasons that Bluehost is the best hosting service for your food blog is that WordPress installation is SO EASY! Choose business or personal – from here you can continue to get assistance or choose the “I don’t need help” selection and explore on your own. From here, you’ll pick a theme. Trust me when I say to just choose the first thing that grabs your attention. You can change this once, twice, or a dozen times later, but if you spend too much time here now, you’ll never get started. See that handful of themes? They represent maybe 1/1000th of the total themes available. Grab one that inspires you and get blogging! Also, grab a free one – some are paid themes, and while you’ll want a paid, custom theme eventually, it’s better to work with someone to design one specifically for you than pay for a pre-made one. Publish Sidebar: This box has everything you need to publish your post when you want it. Depending on your plugins, it will also give you some feedback on readability and SEO score (found with Yoast, as we referenced earlier). You can publish immediately, schedule for a later date, or save and publish after you’ve slept on your writing. Preview: Just like it sounds, it will show you a new tab with what your post will look like once it’s published. When you’re happy with your awesome first post, you can use the big Publish button to send that baby out onto the internet for the world to marvel at! So if you paid for the Security add-on, your site will be pretty secure, but if you don’t do EVERYTHING in your power to prevent hackers from hacking, you’ll kick yourself if it happens. Start by changing your default username in WordPress. Start by logging into WordPress and going to “Users” on the left side. Select “Add New” and pick a username you can remember. Once you’ve created your new password and username, log out, log back in, go to Users, and click on Admin and delete it. Now you can look at themes! Once you’ve gotten established and you’ve got a great rhythm of posting and sharing going, you might want to change your theme around. You can select from the thousands of templates available, and utilizing the “Live Preview” button, you can see what your site would look like with the new theme on your current content. It’s really cool. 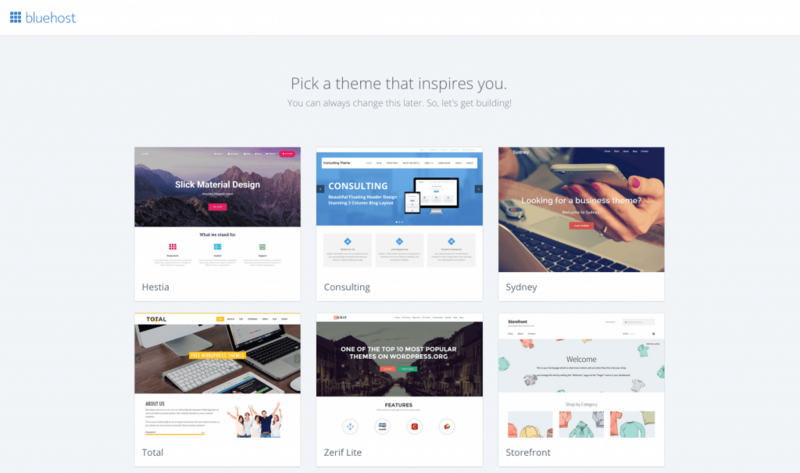 As we talked about before, after a while you can look into buying a customized paid theme. They offer a lot in terms of customization and a unique, branded feel. Studiopress is good, and I’ve heard great things about Elegant Themes as well. I personally use Studiopress to create mine. Once you’ve purchased and downloaded your theme, you can import it fairly easily. Canva is the BEST social media graphic-creating platform I have ever used. It’s incredibly intuitive, allows quick, simple sharing, and has just endless features. It’s worth paying for the full version, but the free version is great for quick and simple graphics. Finally, if you’re selling a product, you’ll want a landing page builder like Leadpages. These create a pop-up that gives some basic information about your site AND offers an opt-in to your mailing list or a sales page to try and convert visits to sales. Creating a food blog is definitely more than just writing about food, posting photos, and all the fun creative stuff, but with a quick Bluehost setup, you’ll be blogging in no time. 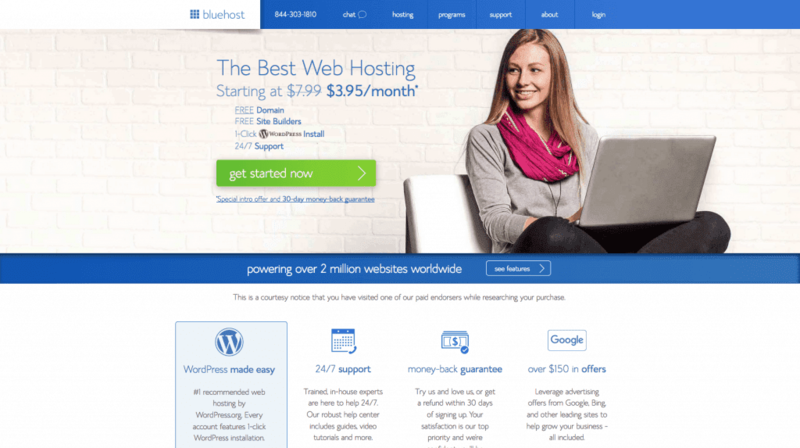 Bluehost truly might be the best WordPress host, offering exceptional service, troubleshooting, and with my discount link, an unbeatable price!